Product #16426 | SKU MBMP-SB-30BB | 5.0 (based on 1 rating) Thanks for your rating! 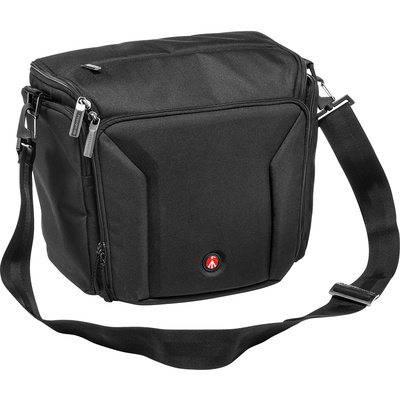 The black Pro Shoulder Bag 30 from Manfrotto holds a DSLR with a grip, an attached 70-200 f/2.8, three additional lenses and a flash between padded dividers in the main compartment. The Pro Shoulder bag also holds an 11" laptop behind a divider in the main compartment and a tablet inside a pocket in the front pouch. Additionally, an extra DSLR body can also be accommodated in a padded, expandable zippered side pouch. For quick-access to your gear, the bag features a convenient top zipper that allows you to reach inside the main compartment. For further convenience, the Pro Shoulder Bag features numerous exterior and interior pockets. Made from water-repellent Cordura nylon, this Pro bag features a multi-layered construction and a front shield that, along with four shock-absorbing feet, better diverts impact away from the middle of the bag. For further impact protection, the Pro bag features red rigid padded interior dividers that are built to withstand impact within the middle of the bag and maintain the interior shape. For convenience when traveling, there is a nylon-webbed trolley strap at the back. For carrying the bag, there is a detachable adjustable shoulder strap with a removable comfort pad and a detachable hand carrying strap at the top. Additionally, a detachable rain cover is included for inclement weather. Beautiful look and rugged multi layer construction. Rain cover included!